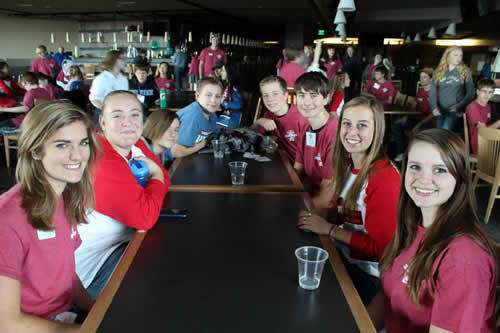 A group of enthusiastic middle and high school students descended on Pepsi Center November 8 in an Avalanche of Leadership! The group was treated to an intense day of leadership training and then got the chance to experience some behind the scenes action at the arena when they went on tour of the facility. To cap off the exciting day, the participants had the opportunity to go out onto the ice and slip and slide and play a little broomball before taking in the Avalanche game that night. During the training, students were challenged to think about what it takes to be a good and effective leader, as well as how to empower others to step up and assume leadership roles though a variety of fun and exciting activities. A collection of photos from the day is located on the COTSA Facebook page. You can view the photos here and you don’t even have to have a Facebook account! If you attended the conference and want your certificate of participation, you can download the PDF of the certificates and print it by following this link – Certificates of Participation 2013. 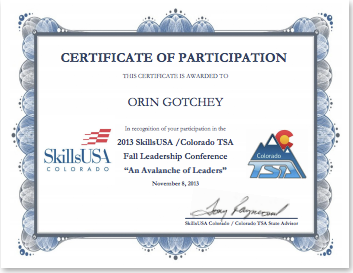 Make sure that you plan to attend next year’s conference!